The size of a bus with eyes as big as dinner plates and a tangle of tentacles covered with suckers, the giant squid has nourished legends and attracted human fascination since the ancient Greeks. 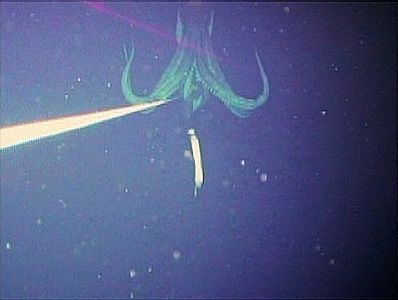 The real thing, a purplish-red cephalopod measuring roughly 25 feet, was photographed 2,950 feet beneath the North Pacific by cameras attached to a baited fishing line. More than 500 images show the squid wrapping its giant tentacles around the bait. The breakthrough ends an age-old search for the elusive creature and shows for the first time the movements, behaviour and natural habitat of these enormous giants of the deep.